A while back we started reviewing our dural fistula experience, looking for a specific kind of fistula. 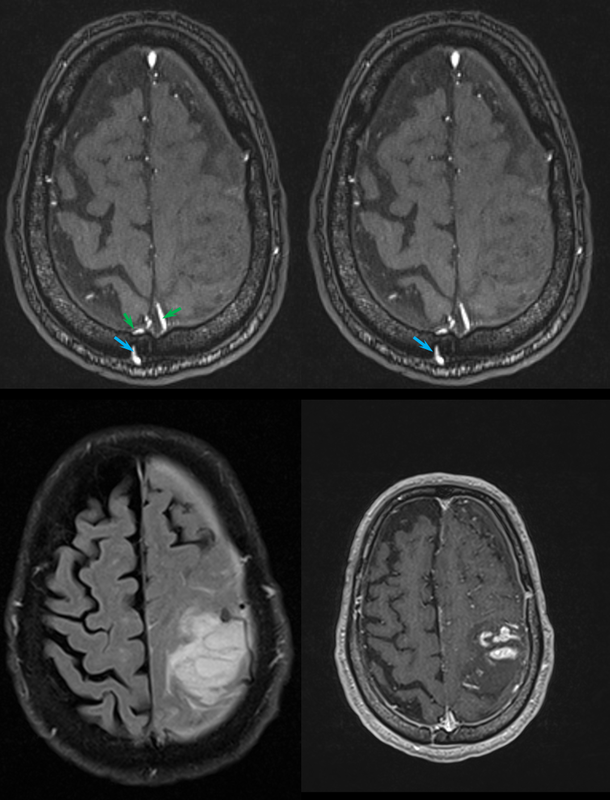 One thing that quickly became clear is that dural fistulas are much more varied in all aspects — location, supply, venous drainage, brain response — than the literature would suggest. 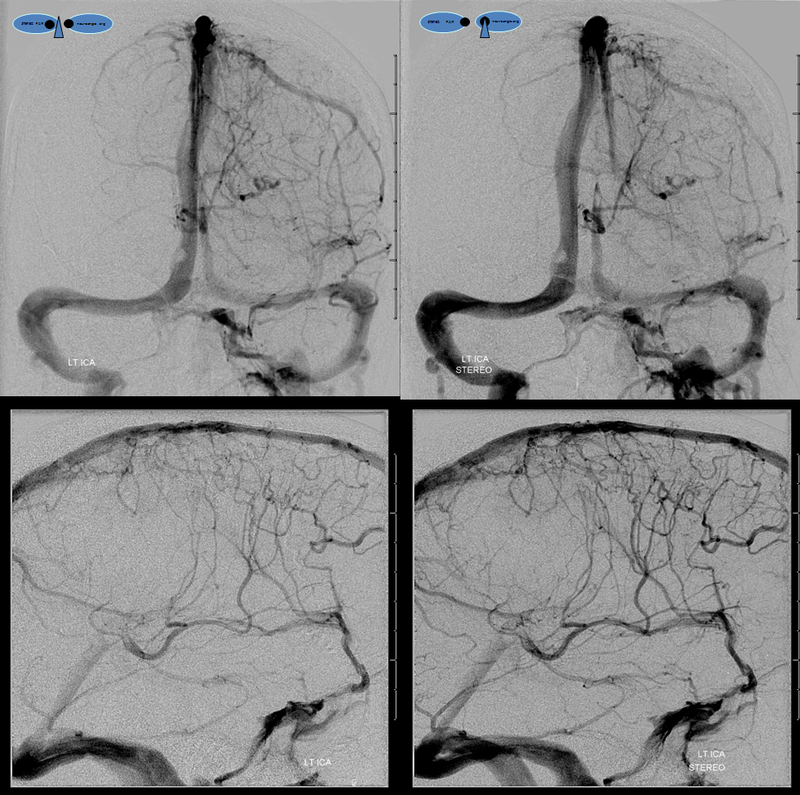 Of course, even for the classic “sigmoid sinus fistula” no two are alike (see dural fistula embolization page). But beyond that, there are so many unique tentorial and other locations, at least in our experience. What this taught me is the importance of understanding the fistula as an entity, not a type. 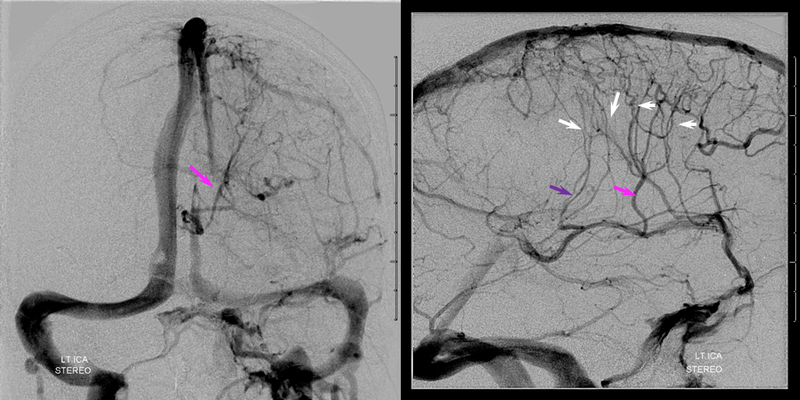 The concept of identifying precise fistula location, its feeders, its venous drainage, and the impact of this drainage on the brain applies to all fistulas, regardless of location. This kind of analysis naturally leads to firm understanding of what must be achieved to obliterate the fistula — namely where the hole is and what needs to be closed and kept open. It results in a much more selective embolization, without painting the whole head with Onyx or whatever else while the one place the embolic material needs to reach remains open. 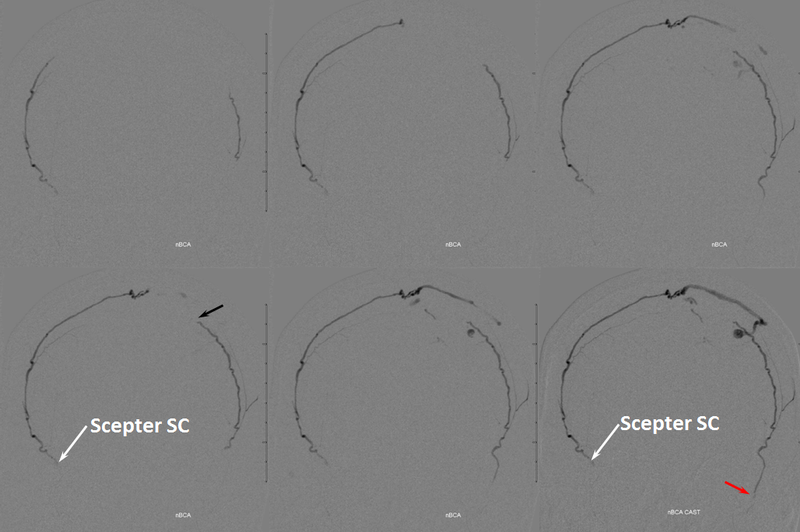 This case shows a somewhat unusual fistula, and its closure by nBCA using Scepter C balloon from a relatively distal location. 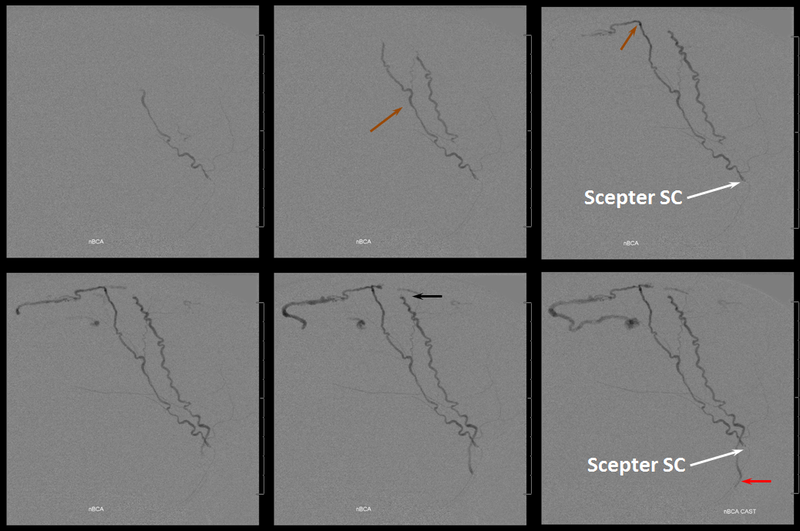 The Scepter has made fistula embolization so much more enjoyable, in our experience, by assuring flow control. It is the same idea as the “pressure cooker” technique, but oftentimes less cumbersome and faster to arrange, with the same results. Next came the MRI and MRA. 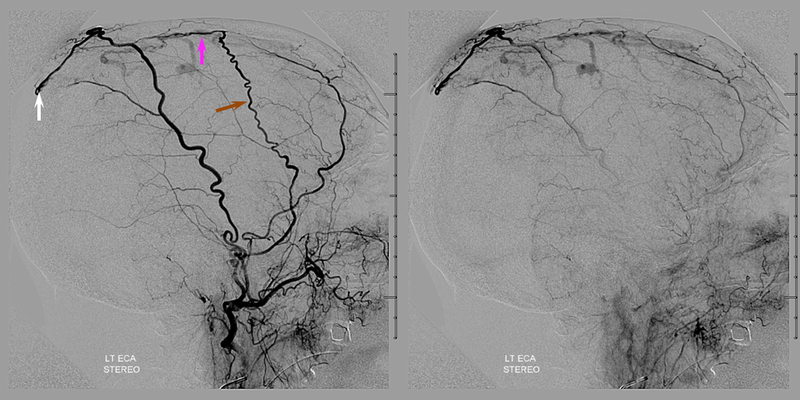 Note flow-related enhancement within the transossesous channel, supplying arterial branches in the wall of the superior sagittal sinus (green). 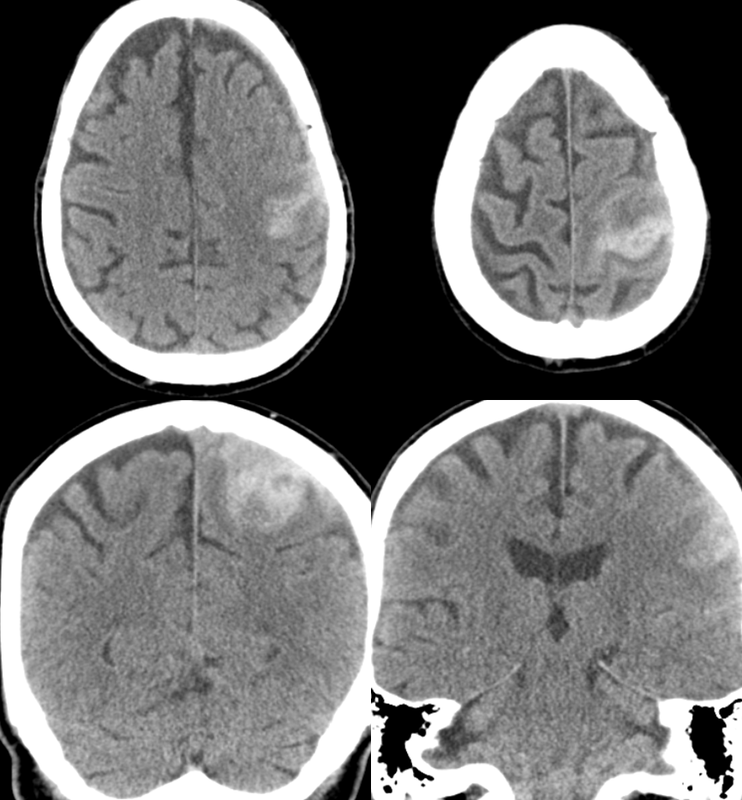 A diagnosis of brain AVM was made based on these images and he was monitored conservatively for 3 weeks, during which he continued to decline. The family decided to bring him back home. 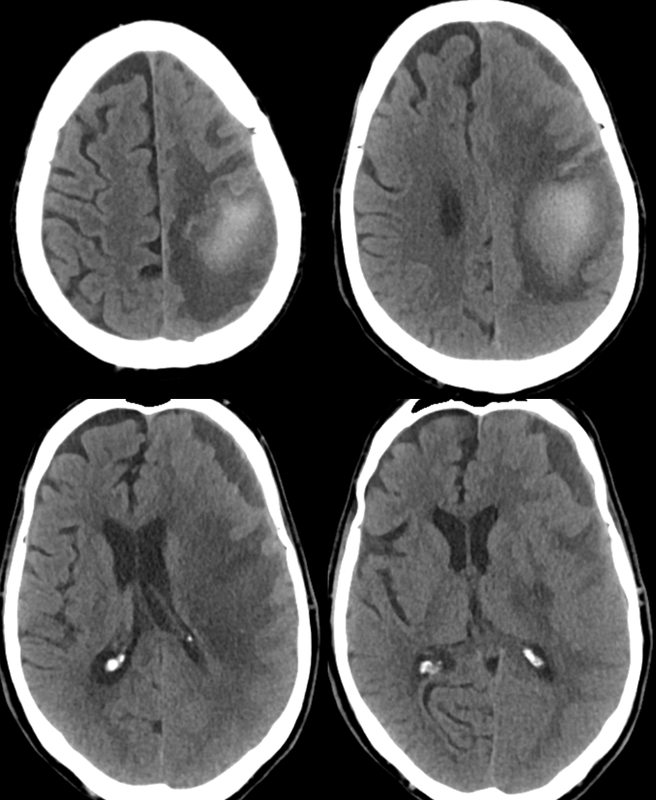 This CT was obtained after his return. Now for the real vascular diagnostic study. 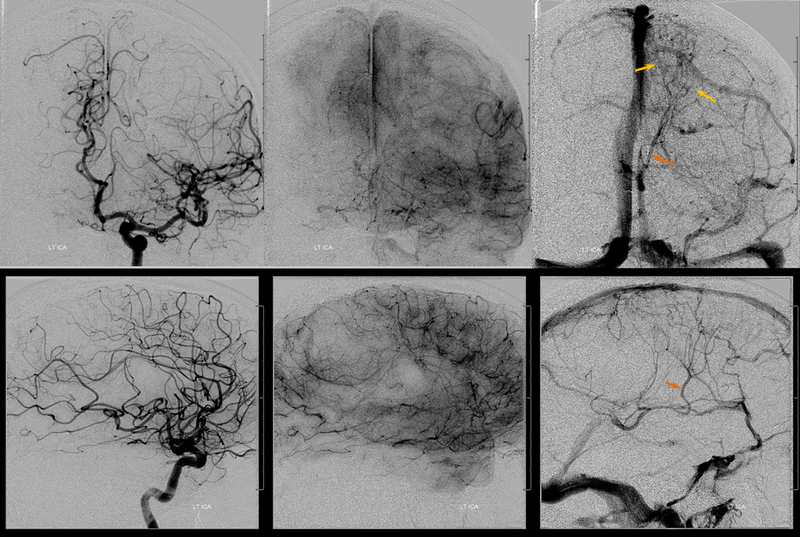 A few pictures of an angiogram show everything you need to know. This is not an AVM — its a dural fistula, Cognard Type IV, to be classy about it. 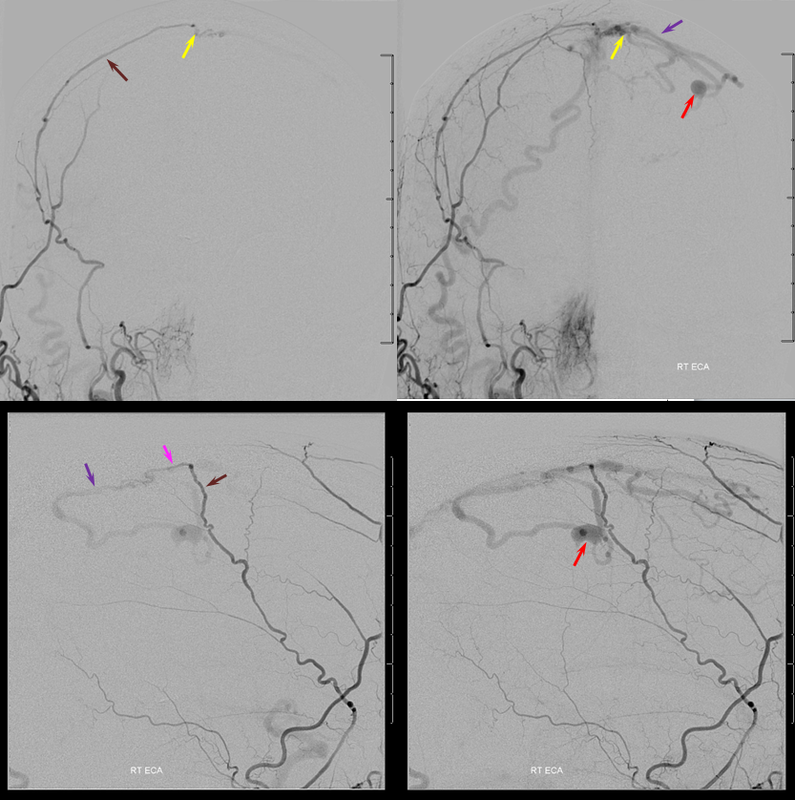 The right MMA (brown) joins the arterial branch in the wall of the superior sagittal sinus (pink) which supplies the fistula (yellow) with direct cortical venous drainage (purple marks proximal vein) and associated venous aneurysm (red). Notice that the vein and sagittal sinus artery (pink) appear “washed out” meaning that there is admixture of unopacified blood from other sources of supply. There is however only one fistula point (yellow) which is critical to understand. The major supply comes from the occipital artery, actually. How? Via a transosseous branch (blue) which we saw on both CT and MRA above. The transossesous branch supplies the dural feeder near the sagittal sinus. 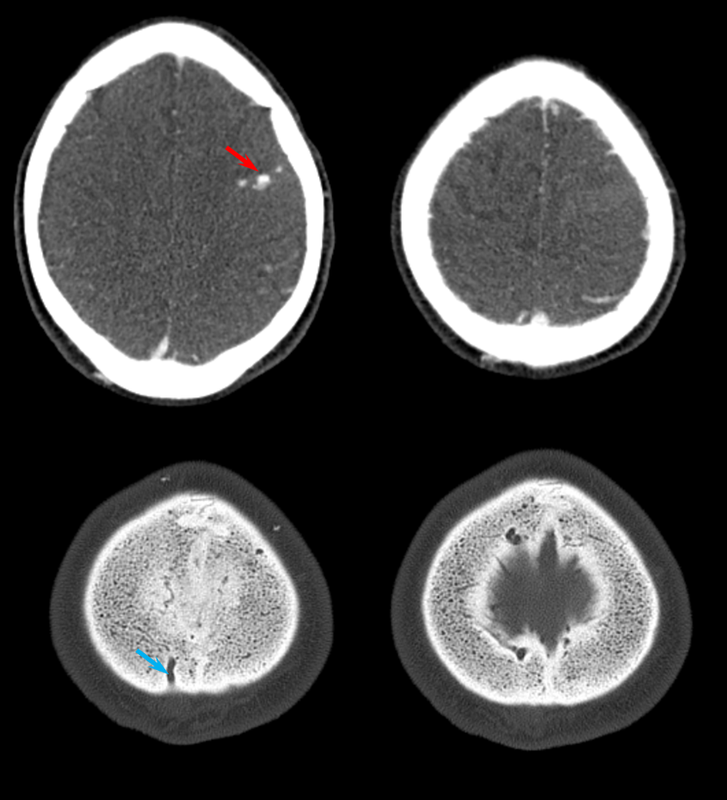 Notice again that there is admixture of unopacified blood into the occipital artery just proximal to its transosseous component — implying presence of another extracranial feeder — either the left occipital or the left superficial temporal arteries. 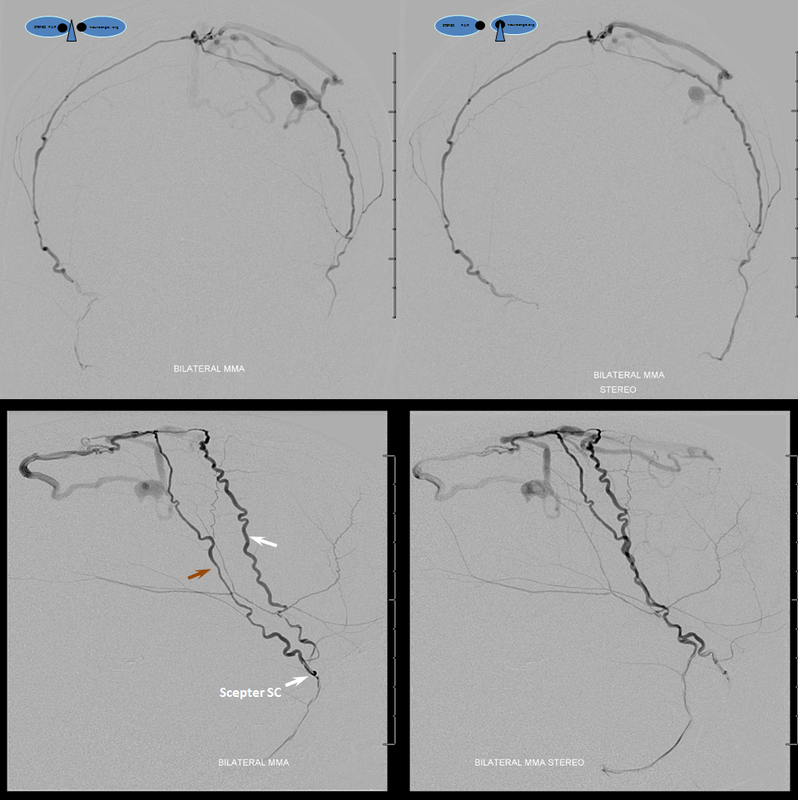 We decide to treat by nBCA injection of the middle meningeal arteries. However, both sides are quite tortuous and we do not expect to get anywhere close to the fistula. However, both ophthalmics come from the ICA and we feel that we can be distal enough from the petrous branch to be safe. Proximal flow control (meaning no possibility of reflux) is essential when injecting nBCA and other liquid embolics such as Onyx from such proximal positions. We use a Scepter SC 4×11 mm balloon to navigate as much as possible into the right MMA. A Marathon catheter is used on the left side in hopes to get further out however we do not get too much further than the Scepter. 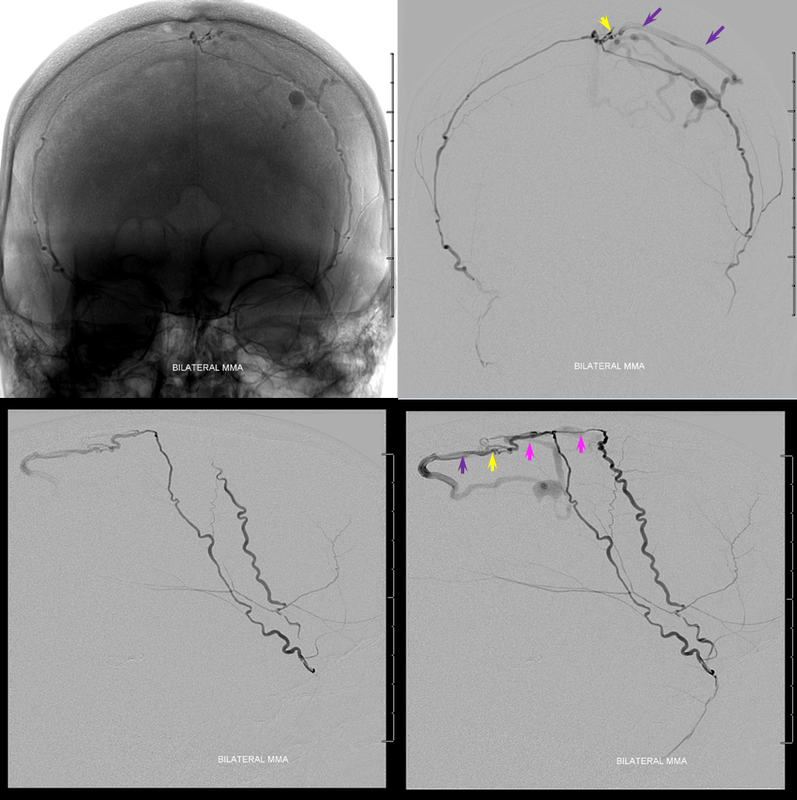 The injection below of bilateral MMAs shows complete visualization of the sagittal sinus artery (purple), fistula (yellow) and its draining vein (purple). Notice that the right MMA (with Scepter in it) is closer to the fistula than the left. This run was made with the Scepter deflated, and reflux on the right is readily visible — there will be none during the glue injection, once the Scepter is up. Now, the awesome stereo views. Left MMA is white, right is brown. The position of the Scepter is shown also. Glue injection. Perfect demonstration of “flow control”. 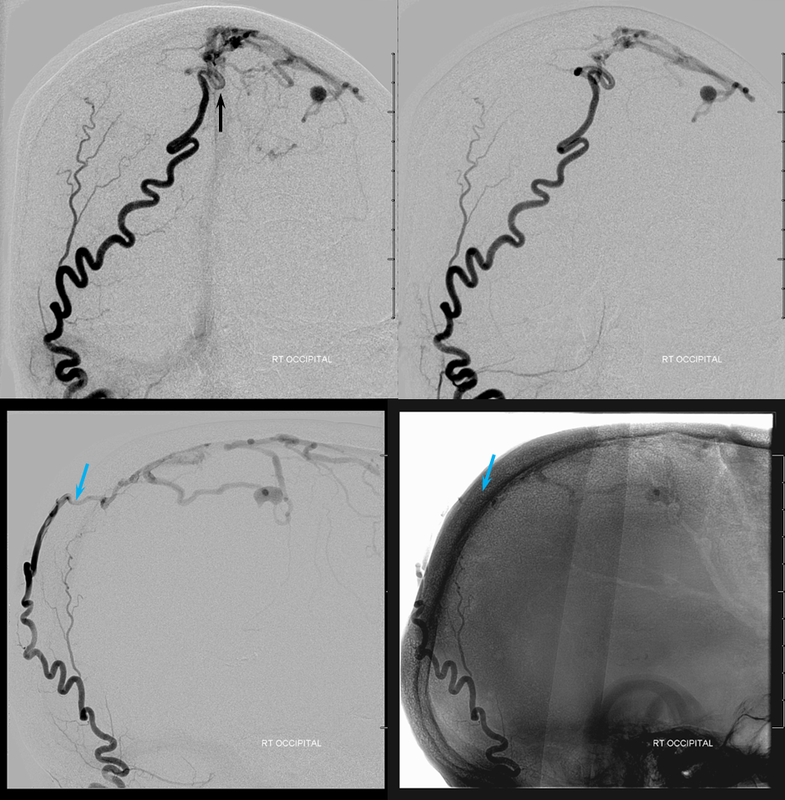 The right side, with Scepter C preventing reflux, shows nBCA progression forward all the way through the fistula and proximal cortical vein to close the venous aneurysm (not the cause of this patient’s hemorrhage — venous infarction is). On the left side, where the marathon catheter does not allow for flow control, the glue goes both antegrade and retrograde. It never makes it to the fistula, progressing no further than the black arrow. Simultaneously there is reflux of glue inferiorly to the point marked by red arrow. Further reflux would endanger the petrosal branch and therefore the facial nerve arcade, and so the injection was stopped on the left. However, the presence of dextrose in the left MMA prevented the glue which was being injected from the right side from polymerising too early, allowing it to remain liquid and penetrate the fistula. So, in truth, only right injection needed to be nBCA. Left one could have been dextrose only. However, we did want to show the difference between having no flow control and having flow control in the same setting and felt safe enough about our left MMA position to go with glue on both sides. It does however require a high level of operator coordination. Left ICA venous phase post embo. Again notice transmedullary veins (white) converging on the thalamostriate (pink) and lateral atrial (purple) veins. The large hematoma is posterior to these veins.